6 Forgot User Name & Password? Online application for Pre/Post metric scholarship to SC, ST and OBC Students in West Bengal for academic year 2018-2019 has been started from 02.05.2018. Students must be a citizen of West Bengal. ** The Income ceiling of parents/guardian is not more than Rs. 2,00,000 to Rs. 2,50,000 per annum. ** SC students studying in classes IX & X are eligible. Adhoc Grant –Rs. 1000/- p.a. Adhoc Grant Rs. 750/- p.a. To apply online Pre-Metric & Post-Metric Scholarships for SC ST & OBC student, please follow the steps given below. Step-2 : Click on the ‘Student Registration’ button in the ‘Student’s Corner’ of the Home Page. Step-3 : Choose your concerned district where your institution is located. For Students who are studying outside of West Bengal, Choose district of your permanent address. Step-4 : Fill all the fields in the online registration form and Click on the ‘Submit’ button. Step-5 : A computer generated acknowledgement slip will be generated, Please download it for future reference. 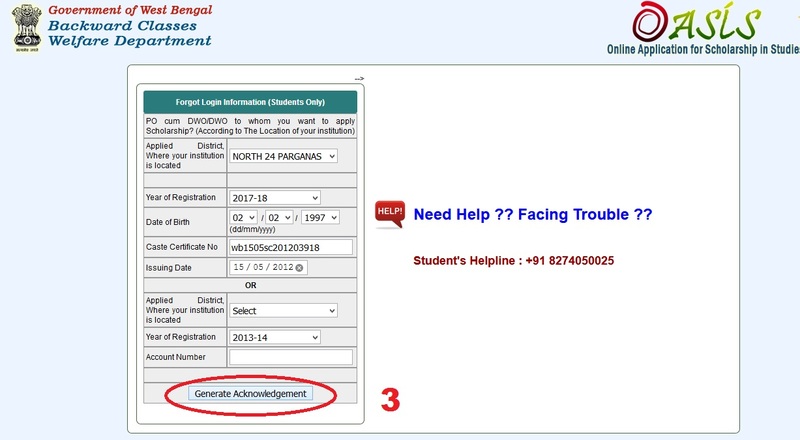 Step-2 : Click on the ‘Registered Student’s login’ button in the ‘Student’s Corner’ of the Home Page. Step-3 : Login with User ID, Password & District as mentioned in your Acknowledgement Slip. After login, Students Dashboard page will appear. Follow the below steps to apply for scholarship. Click on ‘Further Details’ in the Home Page of Students Dashboard and fill up information carefully and save. After that, click on ‘Bank Information’. Fill up your bank information and save it. After Verify & Lock, click on ‘Print Application’ and submit the printed copy of your filled-in application form to concern Block/ municipality as instructed into the last page of your application form after certified the same from different authority as mentioned into the application form. Follow the steps to know your user name and password. Step-3 : Fill the details which is given in below image and press the ‘Generate Acknowledgement’ to retrieve your user name and password. ** Last Date of online application for SC/ST Post-Matric Scholarship is extended up to 15.01.2019 for Bankura District. ** Last Date of online application for SC/ST Post-Matric & ST Pre-matric Scholarship is extended up to 10.01.2019 for Paschim Medinipur District. ** Last Date of online application for SC Post-Matric Scholarship is extended up to 10.01.2019 for Nadia District. ** Last Date of online application for SC Post-Matric Scholarship is extended up to 05.01.2019 for Siliguri Darjeeling District District. I am from Kolkata. I have submitted my application on November 2018. Now my application status is, “Your Application is Verified By District and Waiting for Lot Number till January’2019. My friends already got the scholarship money but I have not got this money. Please send my scholarship. My Application ID is WB010218139836. District: Kolkata. I am from Kolkata and belonging to OBC-B. My friends already got the scholarship amount, but I have not got this. What should I do? My ID of 2017-2018 is WB040218137377. I am from Malda district. Like many students, I also could not renew my Post matric scholarship because of delaying in my caste certificate renewal. Lots of students of my district are facing same problem. So I request the authority to extend the Last date of renewal application for Malda district. I have not got money. Status shows, Your application is verified by district and sanction by state. My lot number is 5028. I have not got money. When I check my application status, it shows “your application is verified by district and awaiting for disbursement”. I want to know when I will get money. I also request you to send my money because I am a Hons student and my financial support is very poor. My application user ID is WB010208240304. I AM A STUDENT OF B.COM 2ND YEAR. I WANT TO FILL UP THE SC SCHOLARSHIP 2018-19 BUT MY 2ND YEAR ADMISSION IS NOT STARTED YET. SO PLEASE EXTEND THE DATE. Please tell me the release date of 2019 scholarship form. My caste certificate is updated today. Can I fill the application now? I am from Kolkata District. Few days ago, I got my SC certificate digital number. Please extend the date for online application of Kolkata District. I have a mistake in my scholarship form so please unlock my application. I am from Birbhum District. I am a student of B.ED 1st year. Few days ago, I got my SC certificate digital number. Please extend the date for online application of SC stipend. I am from Nadia. I am studying BA 2nd year in Bethuadahari College. I want to know about scholarship renewal. Please extend the last date of OBC scholarship in Uttar Dinajpur. I am an OBC candidate. I could not renew my application form due to hand written OBC caste certificate. Now I got computerized caste certificate number. So, kindly extend the last date. I am from Bankura district. I belong to a very poor family. I am a student of B.Ed 1st year. Today I got my OBC certificate digital number. Please extend the date for online application of OBC stipend. I HAVE NOT RECEIVED THE SCHOLARSHIP AMOUNT OF 2017-2018 AND 2018-2019. MY APPLICATION ID IS WB010107294987 AND DATE OF BIRTH IS 07/11/2001. I am doing final year Engineering and applied for Post Matric Scholarship. When will I get the scholarship money? I JUST FILLED UP FORMS OF OBC SCHOLARSHIP FOR ME AND MY FRIEND. THEN WE SUBMITTED IT TO OUR SCHOOL, I GOT THE MONEY BUT SHE DOESN’T RECEIVED IT, I TRACK HER APPLICATION IN OASIS.GOV.IN WEBSITE. BUT IT IS NOT WORKING PROPERLY. PLEASE DO NEEDFUL. I am an OBC candidate. I could not renew my OBC scholarship due to hand written OBC certificate. Please extend the last date of application for Siliguri, Darjeeling District as we did not get our digital number of caste certificate in the right time. Please extend the last date of Paschim Medinipur. I got certificate number on 27th November. So I want to fill the form. Please extend time for Vidyasagar University. Because now only they announced the result of 1st year exam. So time is needed for backward students who are seeking financial support from Backward Classes Welfare, West Bengal. I am a student of master degree. Please extend the date of OBC Post Matric Scholarship in Birbhum. I got my digital OBC Certificate on November 2nd. I am belonging to very poor family. Please help me. I am studying in Maharashtra Aurangabad, but my institution is not listed in the Oasis portal. What should I do to fill the scholarship form? The login page is not opening. Please send me the correct link. I am already registered for this scholarship in North 24 Parganas district. I have received scholarship for Class XI & XII. Now I have taken admission in B.Tech (ECE) in Kolaghat Engineering College in Purbo Medinipur Dist. I could not renew online due to change of district. Please let me know the procedure. Paromita, you just forgot your previous application. And fill up a fresh application because BCW department has not yet develop (or) invent no such ideas that would help you in changing your District. You have keep it minded that you have to choose the proper district where your institution is located nor your inhabitants. So Fill up a fresh application. I filled the scholarship form but my college authority is not signed and stamped it yet. So I can’t get it this year. May I get it in the next year If I applied again? Please advise me. I have not received the acknowledgement slip of my last renewal and here I am proceeding to get it from “forgot password and user ID” but it is not generated to me. Also for new students registration the “caste” option is shown inactive. Please extend the date for OBC category. I am a student of Nabipur Seva Varati B.Ed College (Murshidabad). I request to the concerned authority to extend the date of online post matric apply for Murshidabad District and the others as there was a problem related to my computer generated SC certificate and so many students facing this till now. Though I belong to Coochbehar but I cannot apply from my district. Please extend the date because I have just received my SC manual number and I belong to a very poor family. I am studying MA first year in Visva Bharati university in Birbhum. I belong to the very poor family. I need money for study. Please extend the last date for OBC scholarship in Birbhum. I got my OBC digital number 5 days ago. I am an OBC candidate. I could not renew my OBC scholarship due to hand written OBC certificate but government has declared no extension date for OBC candidate. Please kindly extend the Post Matric last date of Jalpaiguri district because there is some problem on my computer generated caste certificate and many other students are facing the same problem. I want to fill up SC Stipend form as a B.Ed candidate of 2018-20 batch. Please extend the date for Hooghly district. I am suffering from financial problems. Please extend the last date of SC scholarship in Murshidabad district. I belong to very poor family. My family can’t provide the huge amount for my college tuition fee so, please extend the last date of application. Please extend the last date of scholarship application for Nadia district for OBC category. Our admission is started from 29th of October. OBC LAST DATE IS NOT EXTENDED NOW, SO WE ARE FACING PROBLEM TO APPLY FOR OBC STIPEND SO, PLEASE EXTEND THE DATE. Kindly extend the deadline otherwise, I will suffer from financial problems. Please. I cannot understand the misbehave of some famous informative site. They shows that, the last date extend to 2nd week of November. For this issue, I can’t done my renewal. I am from a lower socioeconomic class family. So, every year I need scholarship to continue my study. I didn’t know the online application date is over for this year. So please consider to extend the date. Please extend the last date of the renewal of Post Matric Scholarship, I can’t renew my Post Matric scholarship, as there was not given any email, or anything for alert. My financial condition is very week. Please help me. Please extend the last date of renewal of Post Metric Scholarship of Pachim Medinipur district. I have not get my computerized SC certificate. I cant renew my application due to date and all numbers are switched off. There is no mail address. Please help me. It is very necessary for me to get such amount money. Please extend the date for Maldha district. I am student of Maldha district at SN Bose Polytechnic. I got the digital number two days ago from Coochbehar district (WB), Mathabhanga S.D.O.In many other districts, last date is 27/11/2018. So please extended the online application last date of Maldha district. Please extend the date for North Bengal university. I got the digital number two days ago. 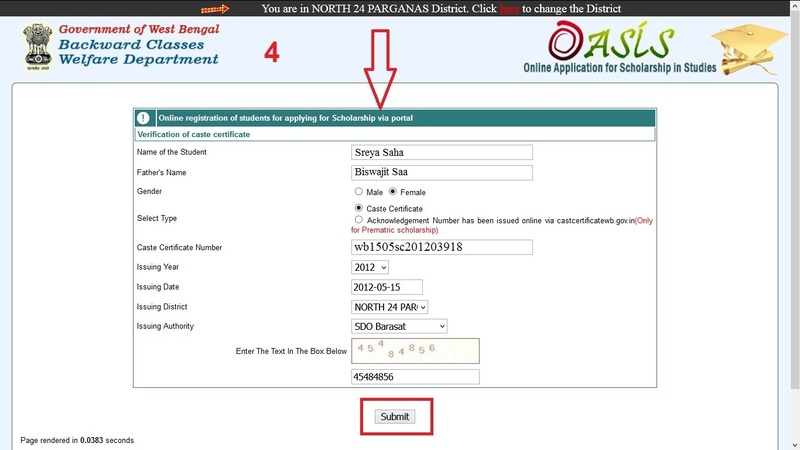 Please extended the online application last date of Post Matric of Paschim Medinipur district. Because our Belda college is not declared the 1st year result. Admission process is going on in Jadavpur University. Still I have get my digital OBC certificate so, please extend the deadline so we can apply for this scholarship. Please extend the last date of application because our Kalyani University is not declared the admission date on 2nd year. Also we are large number student whose are not having digital caste number. So please extended the online application last date of Nadia district. I am an AC college 1st year student from Jalpaiguri. I have not received my digital ST certificate number. So, I cannot fill scholarship form online. So please extend the date. I have not yet received computerized SC certificate number. So I cannot renewal my SC scholarship application. Whether Post Matric SC scholarship renewal date has extended (or) not. My ID number is WB010212144289. When I renew the oasis scholarship form, I didn’t have the Caste Certificate number. After I received it, I submitted my caste certificate for verification on 24th August to the S.D.O office at Raghunathpur but not yet been verified and the last date for renewal is 30th September 2018. Can I get another chance to submit the oasis scholarship form? Please arrange to apply again. Please extend the date of application. I have not found the last date of Post Matric renewal submission. I have a problem on User Id. So kindly extend the date of submission. Please extend the date of online form fill up of Post Matric/ Prematric scholarship. Otherwise, I will suffer financially to carry on my study (B.Tech) in the session of 2018-2019. I APPLIED FOR RENEWAL ON 30.09.2018 AT 11 AM BUT, THE WEBSITE HAS SO MANY PROBLEM AND COULD NOT PROCEED MY APPLICATION. I REQUEST TO THE OASIS PLEASE EITHER SOLVE THE WEB PROBLEM OR EXTEND THE LAST DATE FOR FEW DAYS. I have not yet received computerized OBC certificate number. So I cannot renewal my OBC scholarship application. Whether Post Matric OBC scholarship renewal date has extended (or) not. My ID number is WB010213158856. When I renew the oasis scholarship form, I didn’t have the Caste Certificate number. After I received it, I submitted my caste certificate for verification on 24th August to the S.D.O office at Bankura. but not yet been verified and the last date for renewal is 30th September 2018. Can I get another chance to submit the oasis scholarship form? Please arrange to apply again. My college name is not in list but my all classmates applied with same college name but in my application, my college name is not specified. My college name is Camellia Institute of Technology, Madhyamgram. Please help. My ID number is WB010205279183. When I renew the oasis scholarship form, I didn’t have the Caste Certificate number. After I received it, I submitted my caste certificate for verification on 24th August to the S.D.O office at Ranaghat but not yet been verified and the last date for renewal is 30th September 2018. Can I get another chance to submit the oasis scholarship form? Please arrange to apply again. I have mistakenly submitted wrong date of birth, so please Unlock my application number WB010215324417. I am unable to connect students help line number, is there any other way to connect (or) edit (or) unlock application? Please unlock my application, my application number is WB010207404772. I want to edit my application. So you are requested to unlock my application as soon as possible. Please tell me the last date of submission of the copy to municipality and I have done a wrong thing that is, I forgot to upload my picture, now what can I do? MY APPLICATION ID IS WB040207249418. PLEASE UNLOCK THIS ID BECAUSE I WANT TO EDIT THE INCOME INFORMATION. Kindly visit the BDO/SDO office. They will unlock your application and you can edit your information again. By mistakenly, I have entered wrong account number. Now, how I can change my account number. Please help me. My application ID is WB010206426828. I want to change my hostel name. Please unlock my application. Kindly clarify that, may I have to do self attested in the documents attached with the oasis form? I am from Paschim, Medinipur. I have got OBC scholarship last year. But while going to renew it, found that digital certificate number is required. I could not find the certificate details also. My digital certificate number is not generated. What should I do now? Please reply. I have applied for Oasis last year (2017). But now the application status is showing that it is rejected, but why? please tell me, what should I do now? My application ID is wb010205342018. I AM FROM BURDWAN DISTRICT. I HAVE ALREADY APPLIED FOR THE OASIS SCHOLARSHIP 2018. BUT THERE IS A MISTAKE I HAVE ALREADY DONE AND THAT IS IN FROM PAGE I HAVE FILLED THE UNIVERSITY MODE AS A REGULAR CANDIDATE BUT I AM A DISTANCE EDUCATION STUDENT FROM BURDWAN UNIVERSITY AND THAT IS WHY I AM WORRIED ABOUT THAT. PLEASE PROVIDE ME SOME INFORMATION ABOUT THAT AND IS THIS CREATE ANY PROBLEM OR NOT? I AM STUDYING CLASS ELEVEN. BY MISTAKENLY, I HAVE SUBMITTED THE APPLICATION FOR PREMATRIC BUT I WANT TO APPLY FOR POST MATRIC AND DID MISTAKE IN MY FAMILY ANNUAL INCOME ALSO. HOW CAN I CORRECT IT NOW? PLEASE LET ME KNOW. I am studying class X. Can I now apply for Pre Metric scholarship? Please let me know. I need my last year scholarship. It is very urgent. I want to know the last date of Oasis scholarship . MY SC CERTIFICATE NUMBER IS WB0702SC201503192 AND ISSUE DATE IS 17/08/2015. MY APPLICATION NUMBER IS WB010106190736 AND MY DATE OF BIRTH IS 24/05/2000. I want to apply for this scholarship. What documents are required? PLEASE HELP ME, HOW TO EDIT MY APPLICATION. I can not open this site oasis.gov.in. Please help me. I have entered my college location wrongly, so can I edit it now? Site is not working, please help me. I want to know the last date of online application submission of Post Matric scholarship, session of 2018-2019. I HAVE APPLIED FOR POST MATRIC BUT I HAVE TO DO PREMATRIC. NOW WHAT CAN I DO? Please tell me the last date of application. I want to edit my name because there is an error in my name. What should I do now? I am student of A.N college, Dumka, Jharkhand but a resident of Murshidabad, West Bengal. Can I fill West Bengal scholarship from ? I have forgotten my application ID and password which is registered this year 2018-2019. Now how to know my application ID and password? Please help me. My father passed away few months before. Now I want to apply for Post Matric Scholarship. Whose income certificate is needed to apply for scholarship? They need annual family income so you can use your name in the Income Certificate, If you are a adult member, you can also certify your mother as well as family head. I AM TRYING TO FILL THE REGISTRATION FORM BUT EVERY TIME SHOWS CHECK THE DOCUMENT DETAIL. WHAT SHOULD I DO? HOW I REGISTER FOR SCHOLARSHIP? I am studying Diploma last semester in Civil Engineering. Can I now apply for Post Metric scholarship? Please let me know. I have entered aadhar number wrongly and submitted it. I want to correct it now. Please help me. I am a BSC 3rd year student. I have entered institutions name wrongly and submitted it and I want to correct it, please help me. I don’t know the last date, can you please tell me the last date of application? Please tell me the last date of submission of scholarship application. I want to update the occupation and income details. How can I do it? PLEASE TELL ME, HOW CAN I FIND THE POST MATRIC APPLICATION FORM? My institution is located in Coochbehar but I am a domicile of Nadia. So what will be my present and permanent address? I LOST MY ACKNOWLEDGEMENT. SO, I CAN’T APPLY. PLEASE HELP ME. ISSUING AUTHORITY LEFT BLANK ALWAYS AND AFTER SUBMIT IT SAYS “PLEASE TRY AFTER SOME TIME”. My OBC certificate is not computerized so, it is not accepted by online. Please give some suggestion. WHILE REGISTRATION, IT SAYS ‘TRY AGAIN AFTER SOME TIME’. I am B.Com 2nd year student, can I apply for scholarship? I am an Integrated dual degree (B.Tech + M.Tech ) 5th year engineering student. In oasis scholarship, dual degree (or) 5th year is not available. So, how to apply? Please help me. I am from Howrah. My user ID is WB02020595848. Already I received the lot number. When will the scholarship amount be credited to my account? I WANT TO EDIT MY DATE OF BIRTH IN THE SUBMITTED APPLICATION. PLEASE HELP ME OUT. I WANT TO EDIT THE DATE OF BIRTH IN MY FORM, WHAT CAN I DO? My user ID is WB010214239631. I have forgotten my registered Date of Birth. There is no finding as well as skip option available in the website. Please help me out of this step for going to next step. Please tell me, can I apply for Post Matric OBC Scholarship through acknowledgement number? In the ‘Forgot User ID and password’ section, current academic year (2018-19) has not been added and that is why, I think, it is not working. Then how can I retrieve my user ID and password? please help. Same problem, If you have got solution, please intimate me. Suppose If I get some information then I will inform you. I am a student of class 4th, Am I eligible for this scholarship? This site is not working, please help me. I am from Banshi, I have received my lot number and approved by District Nodia. But the amount has not been credited yet. Please tell me, what I can do. My ID number is WB01025381647. Please mention, what is the last date to apply? Let me know the image size to upload the photo. I CAN’T FIND MY INSTITUTION, PLEASE HELP ME. MY SCHOOL NAME IS CHHAYGHARIA THAKUR HARIDAS BALIKA VIDLAYA. MY NAME IS MIMO BUT MY ACKNOWLEDGEMENT SLIP SHOWS MY NAME AS MOMO, HOW TO CHANGE MY NAME? PLEASE, MAY I KNOW THE IMAGE SIZE FOR UPLOADING? POOR SERVER, CANNOT FILLIP PRE-MATRIC SCHOLARSHIP FORM. We are from rural area and we don’t have caste certificate. What can we do? We want to fill OASIS. I am from Ashokenagar. I have left the timing of the last information for the server problem of my locality. When it was solved, I noticed that the timing of the application was past 4 days ago from the date. This year, I noticed that when I am trying to apply, the page says “the information wrong, please register again”, How can I solve my problem? Please, may I know the deadline for the application of the scholarship. My user ID is WB03021694042. Already I received the lot number. When will the scholarship amount be credited to my account? I am not selected in the merit list. Why? Please tell me. I am studying B.A 1st year now. Can I apply for Post Metric Scholarship?